The Mexican flag adorns this German made glass stein. The embossed pewter appliqué depicts a beautifully detailed Aztec design, and two jaguars guarding a MEXICO ribbon. 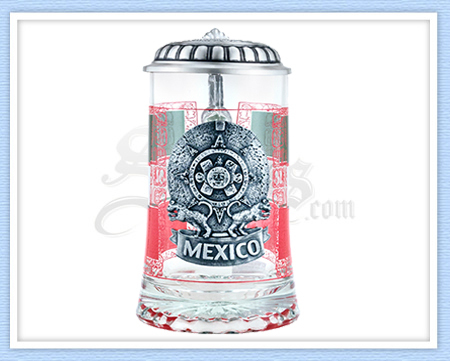 The embossed pewter lid features the seal of Mexico & the word MEXICO. The stein measures 7-1/4 inches in height and holds 16 oz of your favorite beverage.